Gus has been missing since Mother’s Day. When he was taking a walk with his owner in his neighborhood, he slipped out from his leash and ran away and has not been seen since. Gus’s family is not just walking around the neighborhood and putting up signs to find Gus; they hired a pet detective and publicist to find Gus and put up a $2,500 reward. Gus’s family thinks that he may have been stolen especially since he is an expensive pedigree and has a rare coat of blond fur. Gus also has his own agent and was training to be a doggie model. We hope that you find your way home, Gus. 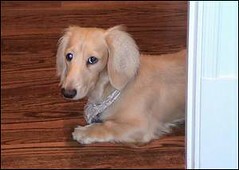 This entry was posted on Wednesday, May 30th, 2007 at 3:44 am	and is filed under Dogs, National Dog, Cat & Pet Info, News for Cats, Dogs & Owners. You can follow any responses to this entry through the RSS 2.0 feed. Both comments and pings are currently closed.